Alex Hosein may have only graduated from pharmacy school a few years ago, but she is already making a big difference in her community. She works at two different pharmacies with diverse patient populations: one near Dalhousie University and the other on Gottingen Street. Alex grew up with health care providers in her family and it was that exposure, plus an interest in science, which initially drew her to pharmacy. A deciding factor was the accessibility of pharmacists. One of the programs she is closely involved with is the methadone program. Methadone is a drug used to treat patients with opioid dependency. 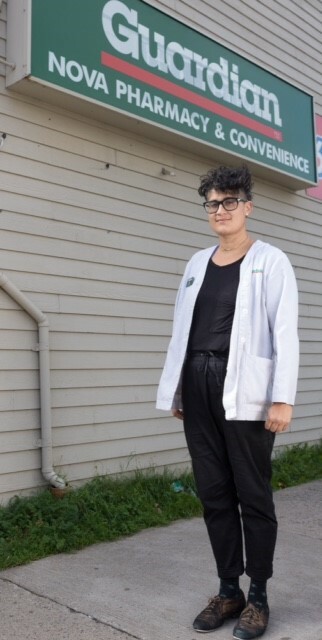 Through this program, Alex works closely with her patients and staff at Direction 180 (a non-profit community-based methadone clinic located in the North End of Halifax) that includes physicians, case workers, and nurses. “I work with pretty amazing colleagues,” says Alex. They would say the same about her. “It’s really important to know and connect with your patients so you can provide optimal patient care,” she says. Another community that Alex is passionate about working with is the LGBTQ2S+ community. There are often issues around access to care. One of the barriers she points out is language. “I try to avoid saying, ‘This drug is risky,’” she says. Instead, pharmacists should discuss potential benefits and side-effects of the medication, using non-judgmental language to offer information which allows their patient to make autonomous decisions. There are a number of resources for health care providers to access if they wish to learn more about specific health needs patients who identify as LGBTQ2S+ and how to appropriately communicate when discussing health issues. In Nova Scotia there is the Nova Scotia Health Authority’s prideHealth (http://www.nshealth.ca/content/pridehealth) and in Toronto the Sherbourne Health Centre (http://sherbourne.on.ca). Alex is greatly concerned about making sure individuals who may be marginalized have access to optimal health care. She has also participated in a number of volunteer programs such as Hope’s Health Centre (a student-led initiative to establish a collaborative interprofessional community Health Centre for marginalized populations in Halifax - www.hopeshealthcentre.com) and Out of the Cold ( a community-based, volunteer-run organization that works to provide shelter & community supports to people who are homeless and precariously housed - http://outofthecoldhalifax.org/ ). “It helps me gain perspective about things I may not otherwise get access to,” says Alex. Her volunteer work helps her be a better pharmacist. Needless to say, Alex loves being a pharmacist.